Here are the two models I talked about a few days ago. They are now done and dusted! I bet you are sick of hearing about PBJs. Well here is my finished 1/144th Minicraft kit. As I mentioned, I had a 'disaster' in that one of the side gun windows fell into the body of the aircraft leaving me a little short to finish it. I got hold of some 1.5mm clear poly sheet and cut out two new windows (I did two so that they matched). I had a problem with the guns as the 1/144th moudlings left something to be desired as they were very thick and had lots of flash. Hence, I have replaced all of the guns with some brass rod. These look much more in scale. I came up with an idea to fit the barrels to the side windows. Heat up the rod and let it melt it's way through the plastic. However, this clear poly is very hard so I was only able to get the rod sealed into the panel - not to get it all the way through. Still it looks fine now. Hey - that's another aircraft finished to a 'reasonable' standard. I must be getting better - grin. Here he is. I am very please with this one. I had some real worries about the camo smock. Mike Grzebian kindly sent me some pictures which helped but in the end I just had to go for it. When I put the original background patches on, it look like a cartoon. I then added the splinter blotches which made it look worse. I then had a brainwave. I took some Tensocrom Oil filter and gently sprayed that all over and - bingo - a toned down result that I think looks the part. You are welcome to differ of course - all criticisms gratefully ignored. I have the 1/72nd Mosquito on the go - just sprayed the cockpit background colour and have part of the wings put together. I also have another Laser Cut wood kit for a building on my railroad. As usual, progress pictures will appear as and when. If you were at all interested, I finished the Shaker Tapestry Cushion and have now started on an even more complicated one. 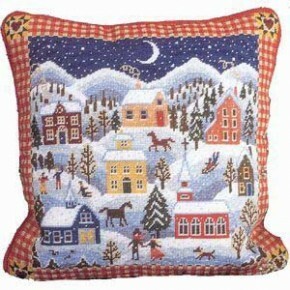 This one is about 30,000 stitches! The next one is even more. It has a border that I reckon will take 5 evenings to complete a single side = 20 days just to do the border! This is the product shot. If you can remember that far back, I made a Hasegawa Marine PBJ in 1/72nd. The Mitchell has always been one of my favourite aircraft but I have never seemed to get around to making what I regard as a classic - an RAF B-25. However, I have now made 2 USMC PBJs. What I like about USMC aircraft is that they always up gun them. PBJs have 4 extra MGs - 2 on each side just aft of the cockpit. 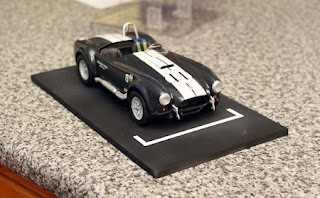 Now, having made a nice 1/72nd version, I came across a Minicraft 1/1/44th so had to make that. However, I only got some way with it before stopping - better things to do! Last month at the club, Eric brought along a 1/144th B-26 Marauder which prompted me to get my PBJ out again. Well here it is. The last one I did, I based in New Guinea so I heavily faded and dirtied it up. This version (albeit the same aircraft) appears as it did when based in Hawaii (one of my favourite spots on earth having been there 3 times!). So good old Raggedy Ann gets another outing. The real reason for doing Raggedy Ann is that the other options had either a solid nose or a re-designed nose - and I like the classic Mitchell look. I forgot that I hadn't posted any piccies of the P-39 in its final state. Here they are. Again, it is based in New Guinea and is suitably faded, as one would expect a matt black nightfighter to get in that heat and rain. It is sat on a sheet of PSP (pierced steel plank) which is what the Seabees used to lay down airfields quickly. This has quite a bit of etched brass and I am quite pleased with the cockpit - not that you can see much of it but it is nicely painted and detailed. there is even a coil of wire attached to the radio behind the seat. On the basis that I am never very happy unless I have a figure on the go, I decided to move out of my comfort zone and tackle a late war SS three colour camo smock. So here it is. Not finished yet but getting close. As usual, it is a 1/10th scale bust by Young Miniatures and is made out of resin. Again, as usual, it needs no fettling and can be painted out of the box. I will show more of this when it is finished. I have a Tamiya 1/72 mosquito on the stocks which I am doing in civilian BOAC markings (wartime though). If you don't know the story, then check back for a full description. After that, I have been left with a battered box of an Airfix Hampden in 1/72. Now I remember Matt Braddock - of Rover Comic fame and from my childhood - flying one of these. Maybe I can do four aircraft in a row without ditching one of them! Oh, did I say - the F-16 SUFA hit the dust. I decided that it was non-recoverable. I will try again sometime. Russian Sailor finished and Airacobra close. Well here are some pictures of the Russian Sailor. I hate taking pictures because these figures always look very crude when blown up large, when in real life they look very good. Oh well, trust me. Fit the propellor and prop boss. Sort out adding the doors. One final coat of matt varnish and that should be it. BTW, I will make sure I get the order right. Once in the past I fitted the canopy and then sprayed the matt varnish. Not a clever thing to do - grin. Firstly, an excuse. I have not been doing much blogging lately because we have been busy closing down our model shop. No - that doesn't mean that SBX is closing - just the physical shop. Internet and Mail Order are as busy as ever. the time taken to close down was more to do with shifting hundreds of pots of paint - take them off the rack - box them up - put them back on the rack again! The biggest task was moving all of the computer systems but that turned out to be the easiest - they worked first time in the new location! If you look closely, you can see that all of these panels have been completed except for the leftmost pair. The top left is about 60% finished and I have the one below that to start. There are three other panels uncompleted on the bottom row. As it is my first attempt, there are some iffy bits but the overall effect is quite good. I particularly like Shaker designs (I did a lot of them when I had the furniture workshop) so I am quite enjoying this. It is something that you can do and think of other things, or listen to Paul Temple tapes, which is what I do. There are currently two projects on the go and one that I have completed. All the chrome was stripped off the sprues and everything re-done using Alclad. A set of Eduard pre-painted etched brass seat belts was put on the driver's seat. I took this to the club last week but don't know what the reaction was until I see the voting. Mind you, as they only seem to like Eric's boats and aircraft, I don't expect much (end of rant - grin). Mind you, if you look at Eric's boats, you can see why - check out here . Eduard recently brought out a combo kit containing 2 P-39s with decals for a series of aircraft based in New Guinea. I have always had a liking for aircraft from this area due to the prevalence of heat and rain making things faded and dirty. What settled it was the night fighter option. A P-39 in matt black seemed to be different from the usual Olive Drab/Neutral Grey. The box comes with two kits, two sets of painted etched brass, canopy masks and about 7 decal options. Some of the etched brass is way too fiddly for me but I used the bulk of the cockpit set. Mind you as some of it can only be done with the brass, there wasn't much choice. Here is the result. But what about the irritation mentioned in the title of this blog - see the last image! I put the decals on last night - usual Microset and Microsol procedure. This morning when I checked the results, I was horrified to find that the decals are so thin that the black shows through the white stars! Click on the picture for an enlarged image. Still it is done now and there is not much I can do about it other than trashing the model and I don't want to do that because this one is NOT MY FAULT! This is a 1/10th bust that I am also working on. There were three difficulties with this one. The pictures show where I have got to. In the second, you can see that I have moulded the front bandiolers - dangle them in boiling water for a few seconds and you can mould them as you wish. The line around the cap is currently work in progress. It is a case of add some white, touch up with blue, touch up with white and so on! I will get there. The Russian script - I am still thinking about that. That's all for now. I am quite pleased with my progress of late. Just as a comment, we telephoned the TV Licensing people this weekend and cancelled our TV licence as we no longer watch any live TV (and I only watch F1 on a play it again for which I don't need a licence). Now I know we can really do without TV and we seem to have won our evenings back for more productive pursuits - like Tapestry!!!!! Here is my finished 1/72nd 251 diorama. Background - an RAF Fighter Bomber attack has left a large hole in the ground and one 251 caught so it can't get itself out - apparently only one injured though. Following on is another 251 and he is now attempting to extricate the first with a tow. The basis of the diorama is a piece of 25mm high density insulation board (used to insulate my shed). This is great material because you can cut it, file it and even press depressions into it. The board was cut to simulate a track in the desert with both side of the track depressed. At one end I evacutated a large hole to give the 251 somewhere to drop into.This was then coated with Vallejo Desert Sand textured paint. A liberal sprinkling and hard brushing of Vallejo Dark Yellow Ochre weathering pigment and lastly some dry brushing with Vallejo Panzer Aces Leather gave the finish a lot of texture. I then added some old 1" paint brush nylon bristles cut to length and glued on end. These were then dry brushed with the same Panzer Aces leather. I then grabbed some pea shingle from the parking area at the front of my cottage and pressed these into the ground. These got another coat of weathering pigments and dry brushing. The basis of the diorama is the pair of Armourfast 251. These come two to a box and are intended for wargaming so have few parts. This means that they go together very quickly but are missing some of the finer details. I was happy to leave most of these 'finer details' off but what I couldn't ignore was that the model didn't have a towing shackle! It's a bit difficult to have a towing diorama without some towing points so I had to scratch build those. In 1/72 two pieces of 160gsm card sandwiching a piece of 1.5mm plastic card did the trick. The towing line is three twisted strands of copper wire - yes there really is a loop at each end! The models do not come with any decals and, amazingly, I couldn't find any 1/72nd Afrika Korps sets so I got hold of a Normandy set that gave me the crosses and the numerals - it's a pity that they are consecutive. I then had to hand paint a representation of the Afrika Korps Palm on the front of each 251. I used Vallejo Model Air Hemp as the main colour for each 251 over a Vallejo Grey primer. I then used Game Ink Sienna liberally diluted with Tamiya thinners and did a pin wash over both vehicles, highlighting the rivets and the panel lines. I then used some Vallejo Airbrush Cleaner to clean up. This also had the effect of working through the Hemp in places so that the base grey primer is exposed. This looks like sand erosion so worked well. Both vehicles were then worked over with the weathering pigment. The one that is in the bomb hole got some very heavy applications to simulate the effect of the bomb blast throwing sand everywhere, whilst the other had a rather more muted application. One interesting thing that I hadn't realised is that there are not a lot of dioramas made in 1/72 but there is a large amount of wargaming going on in the scale. This means that the figures available are all targeted at the gaming fraternity so each and every figure has a gun! Now, I wanted everyone to be in a non-combat situation so I had to go through and trim the weapons off each of them. I also had to move some arms to make more natural poses. The main effort in re-posing went into the injured man who was a crawling figure so basically had to be flattened out. I couldn't find any information on first aid kits so I made a box with a handle, painted it field blue and put a red cross on it. Likewise, there is a white armband and a red cross on the figure kneeling next to him. The rest are in a mix of full Afrika Korps shorts etc. whilst some have the brown jacket and steel helmet. In 1/72nd there isn't a lot of detailing going on with figures - just a reasonable representation. I had a great time making this. Just for once, I had a plan that I wanted to carry out rather than making something that hadn't sold in the shop. In fact, as soon as the 251 was released and I saw the box art, I knew what I wanted to do with the kit. None of model was difficult except for the fact that the drawing on the Armourfast box, which is the only instructions that you get, bore no relationship to the model as provided. The parts are different and it builds differently. It fitted very well and there was no flash. The figures were well moulded and are made of a softer plastic than most kits but not the rubbery material that Airfix uses. The insulation board worked very well except that it didn't react well to the water based texture paint, which shrank and caused the base to bow. I tried to attach the base to a plywood board using the wonderfully named 'Gloop' which is an adhesive for attaching plastic card to other materials. Even liberal applications of masking ta[pe for extended periods wouldn't get the base to straighten out. I am going to have to make a surround for the base. As this is going to the club tomorrow night, I need to get on with this very quickly. The rest of the materials worked very well. The texture paint is very good in representing the desert surface. Overall, it was good fun and I think it ended up the way that I hoped. Armourfast recently released their long awaited 251 kit. Armourfast kits (if you don't know) are low detail wargaming kits that come with two kits in a box. At £7.50, they are very good value. I had an idea of how to utilise the two kits. I am putting together a diorama whereby one 251 has been in a near miss with a bomb dropped by the Allies. It has created a crater into which the 251 has driven. The second 251 is attempting a recovery mission. This is where I have got to. The 251 to the left is to be the one in the hole. As you can see, it is liberally covered with Sand Pigment (Vallejo actually). Both 251 are decalled with Bison decals but currently miss the Afrika Korps palm. Although they are weathered, I still have to work out how to do that! As the palm was in white, I will not be able to print some so I might just go for a painted representation. The figures are from Italeri. As you can only buy 'fighting' figures, I have had to do a lot of chopping to remove weapons. I will do some more figures. My next job is to work on the base. I have some 25mm foam insulation board, used for insulating my shed, which should do the job nicely. Vallejo do a nice pot of desert sand (textured) so after some cutting and moulding with plaster, I hope to have a base. The main problem at the moment is that neither vehicle comes with the towing hook on the front or the towing shackle on the rear. I have still to sort that element out. I know I should have done it before I painted and weathered but I couldn't resist getting on. As this is for the club next Tuesday, I need to get my finger out! Firstly, sorry about being so quiet - I have taken up Stamp Collecting and it is taking me some time to get everything in place for it. I am still modelling but not quite at the pace of a while ago. Young Miniatures 1:10 Soviet Naval Infantryman - in progress - 75% painted. I still have to mould the bandoleers to his body shape! 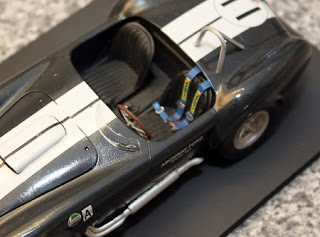 Revell 1/24th Shelby Cobra - Now has the etched seat belts installed and the body is being decaled. Some completion of the kit required after body decaling. Expect to have this ready for Xmas. Bronco 1/35th A13 Cruiser - on hold - very tricky build so that is on the back burner. Armourfast 1/72nd SdKfz251 half track x 2. I intend to make a diorama where one of these is in a ditch and the other is helping retrieve it. It will need quite a lot of 1/72 figures around to make it match photos of most German recovery images I have seen - there are always a lot of rubberneckers! Dragon 1/16th Feldgendarme. After finishing the Young Miniatures bust, I thought I should try a complete figure. I have not made a large scale plastic figure before so this should be interesting. The Ipswich club has a competition this month. 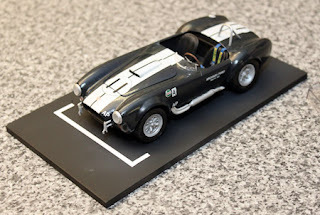 It is limited to Airfix Series 1 kits built out of the box, only. I took home this Fleet Air Arm (FAA) Corsair thinking it would be easy to do - Gloss Sea Blue, limited decaling, etc. However, it wasn't as easy as that. Firstly, all the decals were incorrectly numbered on the decal sheet so I had to forgo some of the tiny ones. You couldn't read them on the instructions so you couldn't work out which was which! There was also a problem with the wings. As I well knew and as was mentioned in the kit description which is part of the instructions, the FAA Corsairs had clipped wings so that they could fit into the hangers of the smaller Royal Navy carriers. However, the model doesn't have clipped wings. This means that I have to do some scratch building. I mentioned this at the club and got some fairly ribald remarks and it was not clear if this action would still qualify for the competition (that is without some bribing of the judge - Eric Dyke). Fortunately, this was all in good fun. However, I am to get the last laugh I think because Kelvin pointed out that the cutting off of the wing tips was in the instructions so I had built the kit out of the box. He is right (see the photo below). So all seems well. Here it is. In September, the club holds their first Airfix Series One Competition. Entries are limited to kits from that series and must be 'out of the box' with no after-market add-ons. I thought that I would try this and see if I could still make a halfway decent 1/72nd aircraft. I got hold of an Airfix Fleet Air Arm Corsair. I like the story that we taught the Yanks how to land these things on carriers - and with aircraft with 18" clipped off their wings, as well. The wing clipping was because our carriers were smaller than the US ones (do some things never change!). I found two problems with the kit - apart from having raised panel lines and rivets that you could shred a finger on. One was the emptiness of the cockpit with the second being the fact that the wings weren't clipped! This I found amazing, because Airfix mentions the clipping in the description of the kit. Oh well. I checked with the Chairman and Secretary to be told that 'scratchbult' would qualify - maybe if I blagged hard enough. So, I have filled out the cockpit a little with some plastic card and taken the required nine inches off each wing. here is a work-in-progress image. There is not a lot to be discerned in gloss sea blue, which is nearly black. Still it will look better once it has some decals. Continuing my mission with1/10th scale busts, here is the next one finished. There was not a lot to this one - head, cap, body and binoculars. Still it was great fun to do and I think I am getting faces to work better. I still couldn't tell you how I do them - I just keep going until they look right. This figure was mostly airbrushed to get the shades right. The face was, as usual, dry brushed to get the final effect. 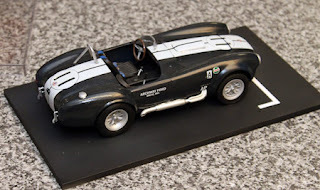 I am also getting on rather well with the 1/24th AC/Shelby Cobra. I am doing it as a late 1960's racer. I have some - cheating - 'pre-painted' seat belts' coming so they should tart it up well. This one is painted in dark blue and everything metal is Alclad. I have yet to touch up the chassis as there are other colours required in there to give it some life. This is the Young Miniatures 'The Black Devil' - Soviet Naval Infantryman from WWII. As you can see, there are a few more parts to this one. So far, all I have done is remove the moulding blocks and tidy up the flash. Unfortunately, whilst cleaning up the bandoleers, I knocked off one shell head and there were three others already missing so I have to think how to recreate these. Fun - what! That's all for now. More in-progress as I go. Don't forget, by clicking on any image you can see a larger version. The busts don't react well to being seen many times larger than life so please make allowances. As ever, comments are welcome, if not mandatory! Here is a shot of the Cobra chassis. I have sprayed it completely with Alclad steel and will now go around and touch in the other colours - mostly black. What is annoying is that I have lost one of the rocker covers. This means I will probably seal up the bonnet (hood) but then again, I may just leave it. Well here is the result of a night in the factory. As you can see, we are left with a nice white sprue - not a scrap of shiny chrome - all ready for a coat of primer and then Alclad will give us the perfect metal finish.